Los Angeles Lakers guard Kobe Bryant and Chicago Bulls guard Michael Jordan during a game at the United Center in Chicago in 1997. The Bulls defeated the Lakers 104-83. While the Los Angeles Lakers have endured a (predictably) poor start to the 2014-15 season, their future Hall of Famer Kobe Bryant continues to rack up individual milestones. In one game last month, he picked up his 20th career triple double and became the first player in league history to record 30,000 career points and 6,000 career assists. And after a 32-point outburst Tuesday night, Bryant moved to within 30 points of Michael Jordan and third place on the NBA’s all-time scoring list — meaning Bryant could pass Jordan in the Lakers’ Friday night game against the San Antonio Spurs. Jordan has always been an easy comparison for Bryant. The two men play the same position (shooting guard), are built similarly (both stand 6 feet 6 and weigh about 200 pounds), seem to possess the same maniacal work ethic, and even have similar-looking games. Bryant’s championship count, five, even rivals Jordan’s six. In the minds of many fans, Bryant is the closest to Jordan the game has seen since Jordan retired for good in 2003. 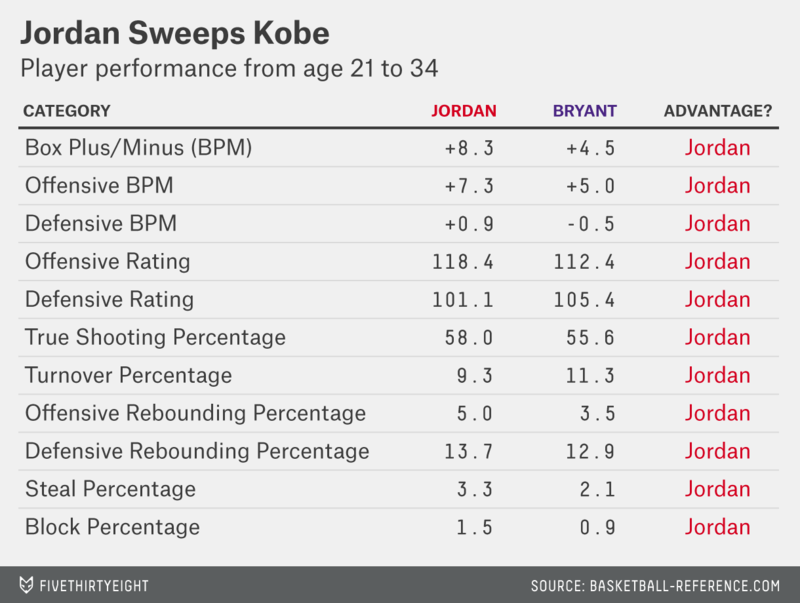 Offensively, Bryant can’t hold a candle to Jordan, mainly because of a disparity in efficiency. After translating both Jordan’s and Bryant’s stats to a league-wide offensive efficiency level of 106 points per 100 possessions to account for the changes in the game (the NBA’s overall average since it merged with the ABA in 1976), Jordan posted an offensive rating of 118.4 between the ages of 21 and 34, while Bryant put up a rating of 112.4. For a top scorer like Bryant or Jordan, an offensive rating boost of six points per 100 possessions can mean an extra four wins for his team in an 82-game season. Because of an effect known as “skill curves,” it can be misleading to directly compare efficiency numbers between players with different offensive responsibilities. (This is why Steve Kerr and Fred Holberg aren’t better offensive players than Allen Iverson and Carmelo Anthony, for instance.) But Jordan’s and Bryant’s roles were of roughly the same, so it’s a fair comparison; between the ages of 21 and 34, Jordan used 31.9 percent of the Chicago Bulls’ possessions while on the floor, while Bryant used 31.6 percent of the Lakers’ possessions when he was in the game. In other words, with essentially the same volume of the offense being directed through each player, Jordan was just a lot more efficient than Bryant at turning possessions into points. Jordan also protected the ball much better than Bryant. Between the ages of 21 and 34, Jordan turned the ball over on just 9.3 percent of his possessions, the best rate ever among players with such a high volume of shooting. Bryant isn’t exactly careless with the ball, but Jordan’s combination of a high usage rate, great shooting efficiency, a good assist rate and a microscopic rate of turnovers is what makes him arguably the best offensive player of the NBA’s post-merger era. Meanwhile, on defense Bryant looks like the Derek Jeter of the NBA — soaking up defensive accolades on reputation rather than performance. Over his career (which includes 12 All-Defensive team nods) the Lakers have only been 0.6 points per 100 possessions better than average defensively, and Bryant’s long-term regularized defensive plus/minus of -0.9 is below average. Synergy Sports, the video-tracking service that classifies every play a player is involved in, has the most favorable view of Bryant defensively but still considers him to be just a 55th percentile defender on aggregate since it began tracking full-season data in 2006-07 (a span over which Bryant was named to six All-Defensive squads). We don’t have Synergy numbers for Jordan defensively, but what evidence we do have suggests that he was better than Bryant at that end of the court. Jordan posted higher rates of steals, blocks and defensive rebounds than Bryant, and team-based defensive metrics like Dean Oliver’s defensive rating consider Jordan far superior (101.1 to 105.4; lower is better on defense) over the age 21 through 34 span after translating for era. Furthermore, the defensive component of Myers’s BPM lists Jordan as saving about 1.4 points per 100 possessions relative to Bryant (whom the metric considers a below-average defender). And while Jordan was in the top 12 percent of 1990s defenders by the aforementioned reconstructed plus/minus rating, Bryant was in the bottom 42 percent of his peers in defensive regularized plus/minus. Bryant will catch — and pass — M.J. on the all-time scoring list soon, but that shouldn’t be taken as an indication that Bryant has been a better basketball player than Jordan. To the contrary, the best statistical evidence at our disposal shows there really isn’t any legitimate way to make the argument for Bryant’s superiority. It’s only natural to hold the two players up side by side because of their superficial similarities, but a serious breakdown of the numbers renders all of those comparisons silly — the better player is Jordan, in a landslide.